During the busy few days of London Fashion Week, I had the opportunity to get down to see the Canadian designer’s FW17 presentation up close and personal. Sid’s Fall/Winter 2017 palette is his boldest and perhaps most symbolic to date. Opulent gold velvet and red jacquard are used in excess, exaggerating Sid’s signature golden ratio proportions. One look that stood out the most was a wide sleeved white blouse which gathered at the waist, and a gold long sleeve velvet top which was characterised by a three tie up knot detail on the back. The use of rich gold was SO refreshing. 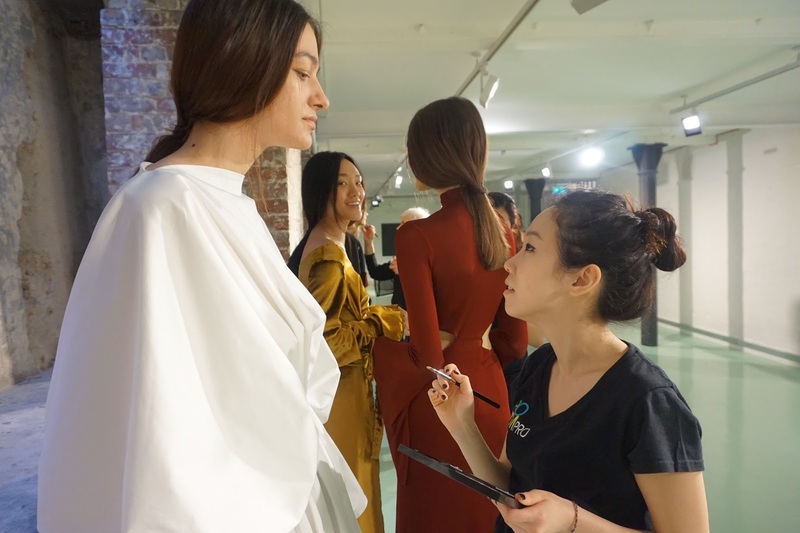 AOFM Pro was on makeup, and created a simple stripped back dewy look on the models. Some of you may have seen clips of the collection on our Instagram Stories, but of course this couldn’t compare to how beautiful the pieces looked in real life. 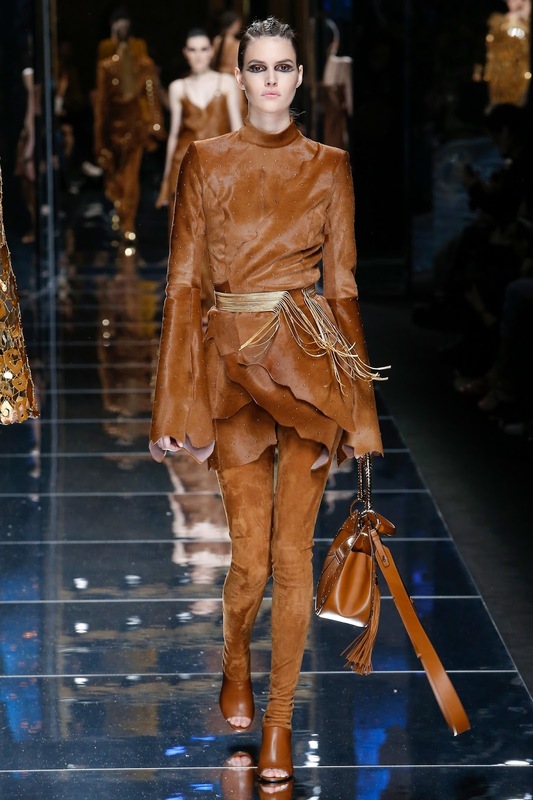 Now the collection felt very 2011 Kim K, and by this I mean the heavy use of leathers, khakis and fur. Taking inspiration from the choka, a traditional “warrior dress” worn by Georgian men – looks included a floor length waist coat, diagonal square stitched puffer coats with dramatic fur lapels and also a black leather mini skirt with a khaki fur trim. This collection was truly beautiful, and was definitely one of my favourites from London Fashion Week. Since the departure of Peter Dundas, an anonymous design team have taken the reins whilst the fashion house appoints a new director. Despite this, the collection presented at Milan Fashion Week was nothing short of stunning. Instead of a runway show, the label hosted a 28 look presentation in Milan’s decadent Palazzo Crespi. The choice of venue, along with the style of the collection felt extremely representative of regality. Some of the looks were so intricately detailed that they looked more like pieces from a couture collection, as opposed to ready-to-wear – such as the floor length sheer gowns. The choice of colours were also very simple and classic as the majority of the looks were either black or white. The high-waist wide leg white trousers, paired alongside a flamboyant ostrich feather coat was one of my favourite looks. 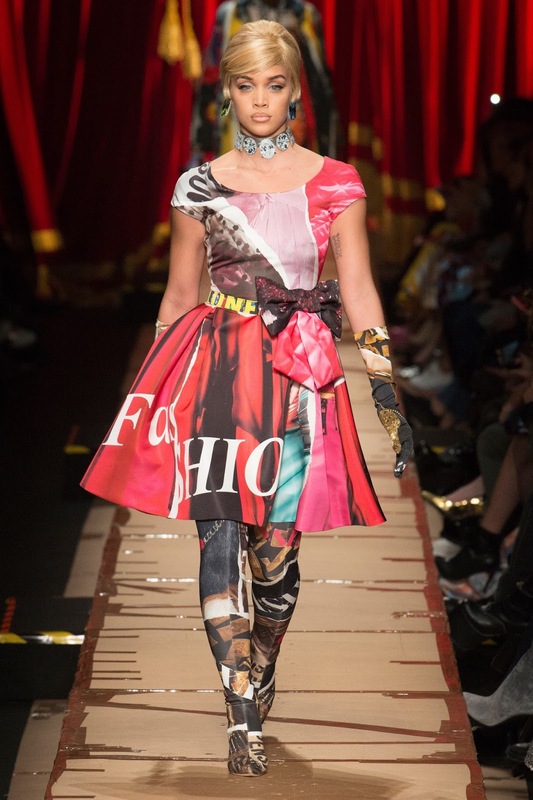 Jeremy Scott never fails to impress me with his fun and extravagant take on high fashion. The hard invites sent out to attendees resembled swiss cheese which were attached to an end of a mouse trap, representing the collection theme of “cardboard couture”. This theme was part of the wider narrative of a rich clothes horse gone broke. In the collection we saw a innovative take on the classic trench, which had ‘fragile’ and ‘handle with care’ notes printed onto the crumpled finish of the coat. 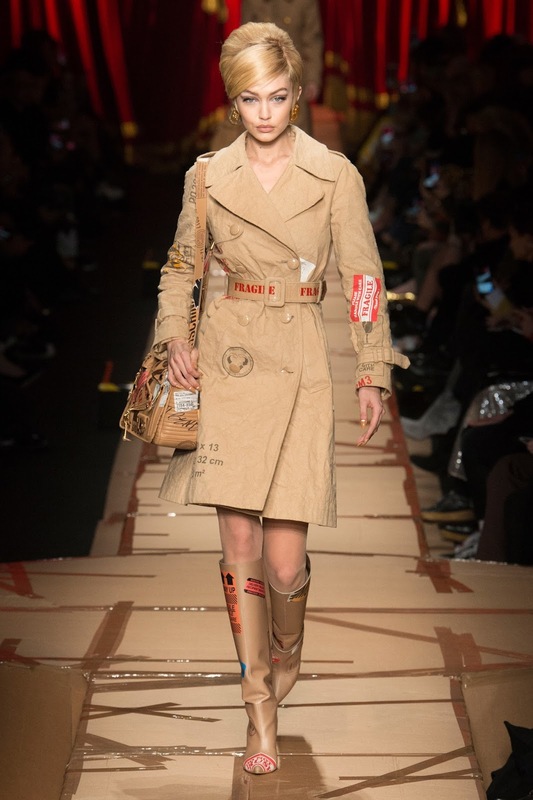 We also saw Moschino printed T-shirts which resembled paper bags as handles were stitched to the bottom and centre. As the looks progressed, we saw outfits that looked like makeshift magazine cut-outs, a rich red dress with gold trimming which appeared to be a curtain, and a black cocktail dress held together by silver masking tape. Again, Jeremy Scott got an A* from me for his creativity. Only Karl Lagerfeld can launch a full blown rocket at the Grand Palais in Paris. The galactic theme of the Chanel FW17 collection saw a new take on their classic staples. 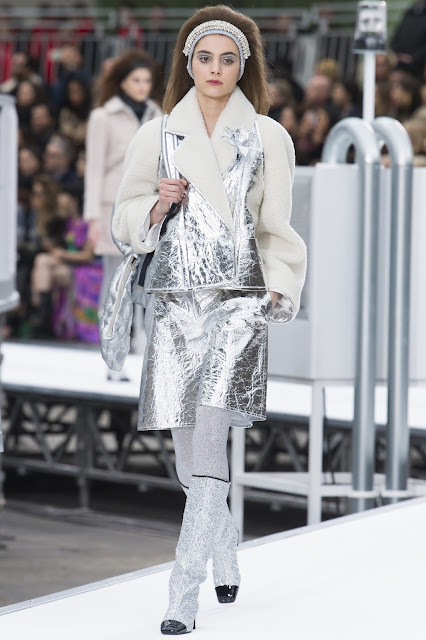 The models wore metallic, glittery lunar boots, sparkly tweed and even oversized mirrored aviators, looking as though they were ready to venture out of this world into space. Although still very representative of Chanel’s signature aesthetic, Lagerfeld successfully presented a modern take on the Chanel we know so well and love. Rihanna has been making waves in the fashion industry as both an influencer and a designer. Heading up as Creative Director of women’s wear at PUMA – Riri presented her third collection as part of Paris Fashion Week FW17 with a “Fenty University” theme. Resembling the tribes one would usually see in a classic school playground – the looks that stood out were the puffer jackets embossed with a varsity style ‘FS’ print, the electric blue lace-up over the knee boots rocked perfectly by London’s very own Leomie Anderson, and of course the plunging jumpsuit which resembled a classic v-neck prep-school jumper. Despite the frantic nature of fashion week, it’s always an exciting time. Seeing how the designers continue to innovate and push creative boundaries blows me away, and is always more than a pleasure to watch and comment on. I look forward to seeing what’s in store for SS18. Running 30 mins late in true Balmain fashion, classical music led by the sound of violin played as attendees filled the space. The lights went down and heavy rock music began to play, vividly contrasting the previously soft and comforting sound. Gigi Hadid opened the show, rocking a distressed black and orange tie-dye shirt which was paired with an embellished suede skirt finished with tassels in varying shades of brown. These colours felt very representative of the Earth, one of the four elements. With a metallic lip present on most of the models, together with three sleek braids – it was evident that the overarching theme of the collection was 90's grunge meets tribal. 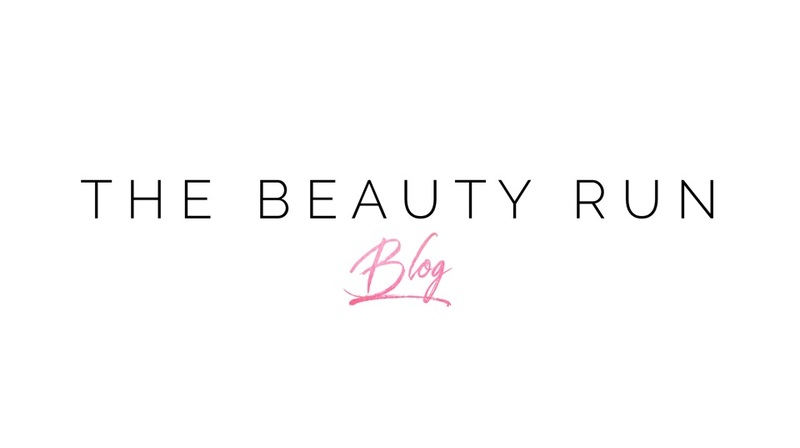 Rousteing revealed backstage: "It’s all about a return to the forces of nature. I wanted to create strong Amazons. Women’s power today is extremely important, and I think I reflect that with this collection. It’s very feminist"
As the collection progressed, the looks were characterised by detailed patchworks, jacquard, embellishment, leather appliqué, metallic studs, tassels and fringe – highlighting Rousteing's skill in craftsmanship. Starting off with browns and gold, as the show progressed we saw deep Earthy red tones emerge, all the way to silver and even a number of looks in stark black. Rousteing went all out with the prints this season, clashing a number of different textures which felt a little different than any of his previous collections. Most of the outfits were worn with long suede boots which progressed way above the usual thigh-high. Although aspects of the collection felt very similar to the colonial feel of his SS17 collection, Olivier added an extra layer with the incorporation of 90's grunge. The t-shirt's of the wolf and the moon, together with the fire effect tie-dye prints that emerged throughout the show reinforced this grunge feel. 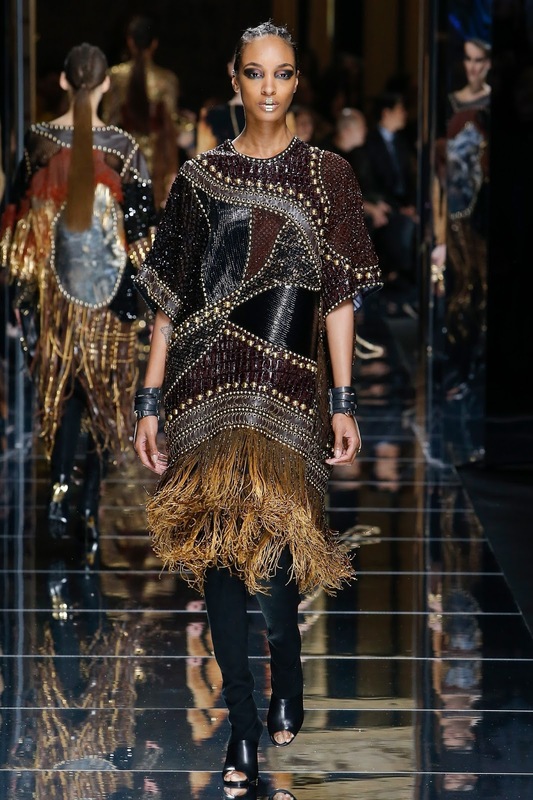 Olivier Rousteing successfully incorporated Balmain's utilitarian meets luxe aesthetic once again. 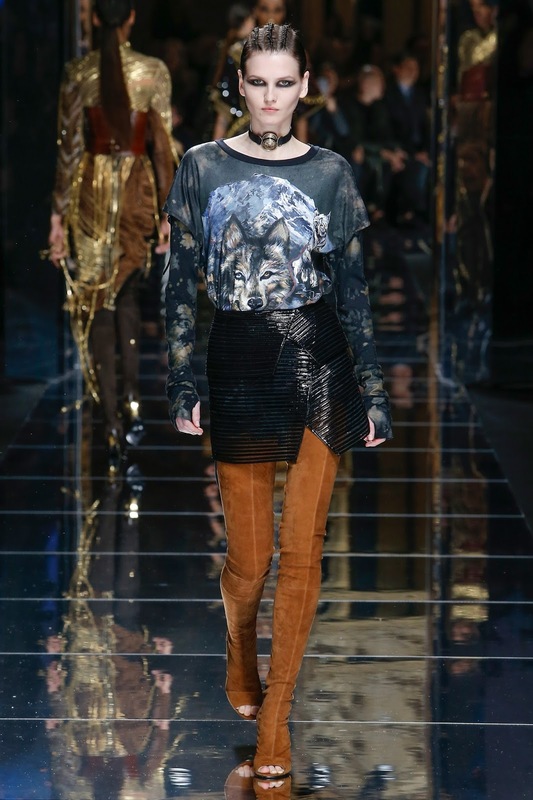 Although the looks were busier than usual, Rousteing did extremely well.